This survey is often overlooked, but gives a detailed assessment of perceptions and plans among small business owners who are members of the National Federation of Independent Business. The NFIB utilises a monthly sample drawn from its large membership base. Small businesses are the bedrock of US payroll growth, being responsible for over 70% of jobs created in the country. In July, the index rose 1.6 points to 105.2 against a 104.8 consensus, which maintained the high levels of optimism experienced post the presidential election on November 8 last year. Seven of the 10 components gained on the month, while two declined and one was unchanged. Since the 2008 crisis, the index peaked at 105.9 in January, which is really only marginally above the July number. The pre-recession peak was 107.2. The headline number was helped by much faster second quarter growth in the US, largely based on accelerating consumer expenditure. Business spending is firming too as consumer conviction grows. We now believe the index is a little too elevated and like measures of consumer confidence, is likely to retrace a little to still sturdy levels around 104.6. Inasmuch as this important data set seems to be off radar, it is unlikely to generate any market response. The US Labor Department's JOLTS (Job Openings and Labor Turnover Survey) report tracks monthly changes in job openings and also includes rates on hiring, separations and quits. The former number is the most important, but the latter is significant too. Should the data show that more people are quitting work for other jobs, this signals that the job market is healthy. The Fed pays very close attention to the survey, but unfortunately the data is released very late and is over a month behind the official Employment Report. Job openings in the JOLTS report have been very strong and moved higher in June to 6.163 million. Hires, however, are lagging behind at 5.356 million, which points to a tighter labour market and difficulty experienced by businesses in filling positions, especially skilled positions. The consensus for job openings in the July report is around 6.010 million. The market response to this data series is for the most part subdued because of the lag in releasing the report. The Mortgage Bankers' Association compiles various mortgage loan indexes. The purchase applications index measures applications at mortgage lenders. This is a leading indicator for single-family home sales and housing construction. The refinance index tracks refinancing activity, and the Composite or Market index combines the two. In the week to September 1, the purchase applications index rose 1.0% on the week, with the refinance index up by 50%. This left the market index higher by 3.3%. We expect further improvement in the week just passed due to compressed fixed mortgage rates. Producer price inflation in the US has been very restrained. In July, producer prices fell 0.1% on the month. But in August, energy prices did strengthen even ahead of the impact of Hurricane Harvey. This should drive a headline PPI increase of around 0.3% to an annual rate of 1.9% to 2.0%. Core PPI is likely to incline about 0.2% on the month and hold steady at an annual 1.8%. Excluding food, energy and trade services, the consensus is for a build of 0.2% after a flat reading in July due to low trade services’ prices. Investors are far less receptive to producer price numbers because the competitive nature of the US economy restricts pricing power and producer and consumer inflation readings often diverge markedly. Ten months into fiscal 2017/18, and the federal government's deficit in July was tracking 10.6% above fiscal 2016/17. Government expenditure, notwithstanding Trump’s presidency and a fiscally conservative Congress, is on the rise. Increases in Social Security payments and net interest payments are keeping the expenditure ceiling elevated. Higher receipts, and particularly rising revenues from personal income tax, have only partially offset the rise in expenditure. It must be remembered that personal income tax in the US makes up around 70% to 75% of total government revenues. The monthly budget balance has many seasonal features. While the fiscal deficit in July was around minus US$42.9 billion, economists are calling for the deficit in August to widen to approximately minus US$119.5 billion. This means more borrowing, although it appears certain now that the debt ceiling will be raised. A very big August deficit, above say minus US$125 billion, could prompt some uptick in yields because the fiscal balance is integral to any measurement of country creditworthiness. But the market realises that seasonal factors are at work. Initial jobless claims have been low of late and have for some time signaled good future payroll creation down the line. But in the week to September 2, initial claims ramped up 62,000 to 298,000, well above projections. Forecasters did not predict such an early effect from Hurricane Harvey, and now Hurricane Irma is on its way. We foresee a further rise of around 15,000 in new claims to 313,000, but stress that these increases are due to transitory factors. The post-hurricane period will see a lot of infrastructure renewal and payroll additions. In the week to September 2, the 4-week moving average that serves to smooth out volatility, rose sharply to above 250,000, at 250,250. We anticipate that the average will have risen close to the 255,000 mark in the September 9 week. Like the equivalent producer price numbers, US consumer inflation has been very muted this year, but August will have seen some feed through of higher energy prices to the headline number. In July, headline CPI only got up 0.1% on the month, but we are looking for plus 0.5% in August. At an annual rate of only 1.7%, the July rate was low, but energy prices should take this rate to at least 1.9% in August, which is closer to the Fed’s 2% inflation objective. The Fed, however, looks to core inflation readings and recognises the transient influence of higher energy prices, which will remain in place for a few months because of the destruction of a good deal of refining capacity. As to core inflation, US core CPI inched up a mere 0.1% in July, and we do not see much more than a 0.2% elevation in August. This could well take down the annual rate to 1.6%, which would further incline investors to the view that the Fed will only move on rates in the middle of next year. This should prompt a little US dollar selling, a slight compression in Treasury yields, but ensure that gold remains well bid. The headline retail sales number for August will be affected by lower unit vehicle sales, due to Hurricane Harvey. We expect the headline number to stay flat or rise only 0.1%. But retail sales ex-autos is the more important number and here we see August expansion of 0.5%, the same as in July. Stripping out autos and gasoline, and we are looking for a 0.3% increment, lower than the 0.5% seen in July. Sales by value for gasoline in future months will escalate due to hurricane-related impaired refining capacity. The control group, which takes out gasoline, autos, and building material sales and is the more important for GDP purposes, ramped up 0.6% in July. We only expect half that rate of increase for August. The retail sales numbers are important given the extent to which consumer spending is underpinning US growth. Such sales make up nearly a third of total household consumption expenditure. The market sometimes reacts in knee-jerk fashion to the headline number, but we stress that vehicles have already shown to be weak, and that it is the control group figure that counts for GDP measurement. We think it will decelerate on the month and might leave some USD weakness in its wake. Remember, that this is a composite number combining mining, utility and manufacturing output. The market is only interested in the manufacturing number. In July, the headline production number escalated 0.2%, but in fact manufacturing output on the month was down 0.1%. Recent manufacturing surveys give us the impression that manufacturing production will rise on the month in August in the order of 0.2% to 0.3%. Capacity utilisation is likely to hold around 76.7%, but will fall due to hurricane impacts down the line. These manufacturing numbers are already in the market, so we expect little if any response to this outcome. This is an important number because it includes manufacturer (factory), wholesale and retail inventories. Re-stocking has been evident of late. In June, business inventories built 0.5% and while we do not see this rate of expansion in July, we are expecting a rise of at least 0.2% for the month. Rising inventory values are good for US GDP. This measure of consumer confidence has been running below the corresponding series out of the Conference Board. By July, the headline number was quite a way off the figures at the start of the year. However, in August this number did manage to climb from 93.4 to a final August number of 96.8 (+3.6%), which was actually lower than the flash estimate of 97.6. Nevertheless the August reading was a full 7.8% higher year-over-year. 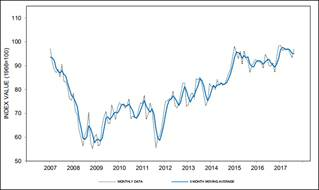 Consumer confidence has remained at a very favourable level with the Sentiment Index higher during the first eight months of 2017 than in any year since 2000, which was the peak year of the longest expansion in US history. The renewed strength in 2017 has been mainly due to consumers’ favourable assessments of their own financial situation. Low unemployment, restrained inflation, and generous interest rates, as well as renewed gains in the value of homes and equity portfolios, pushed personal financial evaluations to near all-time peaks in August. When asked about news of recent developments, surprisingly few consumers made any reference to Charlottesville, North Korea, or Harvey, although too few interviews were conducted in August to fully assess the storm's ultimate impact. Harvey will almost certainly take down third quarter growth in the US, and higher gasoline prices will directly impact consumers, as we have alluded to already. Prior to the storm, consumers anticipated no increase in gas prices in the year ahead (an expected change of just 0.4 cents). Given the current resilience of consumers, temporary increases in gasoline prices as well as a brief period of weakness in economic growth and employment are unlikely to derail confidence in the medium term, but might make a difference in the near term. The above-mentioned events, we argue, are more likely to increase precautionary sentiment and to temper spending trends. We are looking for a September flash estimate of 95.7, which is below the common consensus for 96.0. We think the Hurricane effects on sentiment will not endure and we know that this is understood by the markets. We do not see an adverse market reaction should the headline number fall even below 96. In any event the flash number is just a preliminary estimate. The RMB/BER Business Confidence Index tanked 11 points to 29 in the second quarter of 2017. This was the lowest level seen since the last quarter of 2009 in the immediate aftermath of the most severe global recession of the post-war period. Confidence declined across all of the five sectors surveyed. Notwithstanding an uptick in quarter two growth, amid a dissipation of drought effects, economic policy uncertainty and dramatically escalated political factionalism will keep this number very low, perhaps even under 29, at around 27-28. Low levels of business confidence are reflected in extremely poor business spending that is focused in the main on maintaining and repairing existing capital stock, and not on investment in new capital goods. We expect that the outcome of this survey will occasion some rand weakness, although we have come to expect SA bond yields holding steady. Domestically-oriented stocks like banks and retailers, could come under a little pressure again. South African retail sales rose by 0.2% on the month in June, 2.9% year-on-year in June and 2.2% yoy for the second quarter. The annual figure was much higher than the 2.2% expected. This came after a downwardly revised 1.6% gain in May. Sales rose the most for food, beverages and tobacco in specialised stores (plus 12.4%), household furniture, appliances and equipment (plus 8.3%) and other retailers (plus 5.8%). We advise that sales could get up 0.3% in July, for at least a 2.4% annual rate of growth. This would be a follow through from a slightly better quarter two consumer showing than expected. The figure is unlikely to spark any re-rating of retail stocks, some of which are still quite expensive. South Africa recorded a current account deficit of minus R92 billion or 2.1% of GDP in the first quarter of 2017, wider than the minus R76.4 billion deficit in the previous quarter which amounted to 1.7% of SA GDP. The markets were expecting a Q1 deficit in the region of minus R85 billion. The deficit on services, income and current transfer payments widened to a shortfall of R149 billion from a shortfall of ZAR 132 billion, mainly due to a significant decline in dividend receipts from abroad. But the trade dimension of the c/a balance is far healthier. In quarter one, South Africa’s trade surplus rose to R57 billion from R56 billion, boosted by a slight increase in the value of net gold and exports. In quarter two South Africa’s trade surplus amounted to approximately R22.5 billion, and this could help the overall current account deficit, which will still be exaggerated due to income and transfer payment issues. These factors might take the Q2 current account deficit to about minus R95 billion, but we think this will have little effect on the rand inasmuch as the deficit is still manageable and only a small proportion of overall GDP.